In the 1870s, the Harvard College Observatory began to employ young women as human computers to record and analyze data. 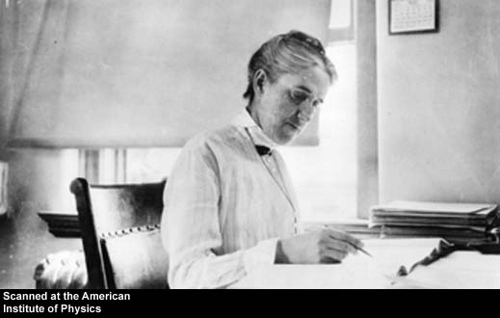 One of them, Henrietta Swan Leavitt, discovered a way to measure stellar distances using the pulsing of variable stars. Quotations are from George Johnson's Miss Leavitt's Stars: The Untold Story of the Woman Who Discovered How to Measure the Universe (W. W. Norton, 2005). Harlow Shapley, director of the observatory, reckoned the difficulty of astronomical projects in "girl hours"the number of hours a human computer would take to obtain the data. The most challenging projects were measured in "kilo-girl-hours." You were not the only deaf woman there. Annie Cannon, too, was hard of hearing. On the day of your death she wrote: Rainy day pouring at night. The body is a computer. The body has two eyes. For the body, the process of triangulation is automatic. The body can see the red steeple of the church beyond the trees. Blackbirds unfold as they grow nearer, like messages. The body never intended to be a secret. The body was called a shining cloud, and then a galaxy. The body comforted mariners, spilt milk in the southern sky. The body was thought to be only 30,000 light years away. The body is untrustworthy. It falls ill. The body sits at a desk. A high collar, faint stripes in the white blouse. In this rare photograph, the body is framed in light. The gaze is turned down, the hand poised to make a mark. The body says: "Take photographs, write poems. I will go on with my work." and not allowed to touch the telescope. The body gives time away with both hands. The body, when working, does not know that time has passed. The body died in 1921. The body's edges are so far from one another that it is hardly a body at all. We gather the stars, and we call them a body. Cygnus. The Swan. My husband and children asleep. this is a way of keeping faith. Show me how to read music. in epochs, in breaths, in light years, in girl hours. Sofia Samatar is an American of Somali and Swiss-German Mennonite background. She has lived in Egypt and South Sudan, and is currently pursuing a doctorate in African Languages and Literature at the University of Wisconsin-Madison, where she specializes in twentieth-century Egyptian and Sudanese literatures. Her poetry is forthcoming in Bull Spec and the anthology The Moment of Change, and her debut novel, A Stranger in Olondria, will be released by Small Beer Press in 2012. She blogs about books, the Arabic language and other wonders at sofiasamatar.blogspot.com. Read Sofia's discussion of this poem over at the Roundtable! Photography: Henrietta Swan Leavitt at her desk, from the AIP Emilio Segre Visual Archives.